The World's Best Sonic Toothbrush is the Cybersonic3, without question. It is an interesting design of sonic toothbrush. It's the THIRD version of a unique brushing system designed by an american dentist and developed by his small company, Amden Corporation, after 20 years of research. The Cybersonic3 is MY everyday brush. I've found it to be very effective, and I like the way it works; the brush action is smooth, and it feels like my gums are being gently massaged, more than with other electric toothbrushes I've tried. I really like the fact that it's very simple to use. There are NO complicated programs to choose from, and the overall design of the brush is sleek and simple. It does everything that I would expect from the best sonic toothbrush, AND AT AN AMAZING PRICE. In terms of value-for-money and performance-for-your-buck, I think it is unequalled. BUT YOU CAN ONLY GET THE BEST PRICE BY USING MY UNIQUE COUPON CODE NUMBER ON THE AMDEN CORP WEBSITE. You have to go to Sonictoothbrush.com and when you order your Cybersonic 3 system, you MUST use the coupon code number 11486826. You will get the brush system at 50% of the standard recommended retail price, which is even BETTER than you can get at Amazon or anywhere else on the planet. Performance. My Cybersonic is very effective at cleaning around my teeth quickly, getting them nice and clean. It is so effective due to the extremely high frequency of the brush tip vibration.This sonic toothbrush vibrates the bristle tips faster than ALL other top (ie. more expensive) sonic brushes. Other top-of-the-line sonic toothbrushes such as the Philips Sonicare DiamondClean, have a tip vibration of around 31,000 times per minute. 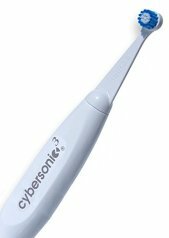 The Cybersonic bristles vibrate at OVER 40,000 times per minute. At that high speed, it's very effective! This really is a "sonic" toothbrush! The vibration speed is important because as the bristle tips vibrate, they create tiny bubbles within the liquid. These microscopic bubbles appear and collapse in tiny fractions of a second. As they collapse, they release a small burst of energy. (This is called "cavitation"). And the faster the tips vibrate, the smaller the tiny bubbles. And the smaller the bubbles, the more they get into the microscopic nooks and crannies where bad bacteria stick to your teeth. The result? I have found that it works extremely well at getting dental plaque and food debris off my teeth. They feel much cleaner, and really fresh! In addition, this brush makes use of another principle called harmonic resonance. You know the way a tuning fork or expensive wineglass has a very clear ring when you tap it, that seems to last a long time? That's harmonic resonance! The Cybersonic brush has brush heads that are designed to resonate at the same frequency as the powered vibration; 40,000 times per minute. This ingenious idea boosts the effectiveness of plaque removal. I have experimented at home with several other makes of electric toothbrush, and the Cybersonic is easily the BEST sonic toothbrush for getting plaque off my teeth. Extra attachments. As well as the standard size head (which I think is the best), my Cybersonic 3 came with an electric flosser and a tongue cleaner that both plug onto the Cybersonic handle. The tongue cleaner works very well, and the flossing tool works like the WaterPik Power flosser, although the WaterPik device is much smaller. Price. Although this brush is normally marked to retail at around $100, you can get a FANTASTIC deal by dealing DIRECT with the manufacturer, Amden Corporation. BUT YOU HAVE TO USE A SPECIAL COUPON CODE TO GET THE BEST PRICE. 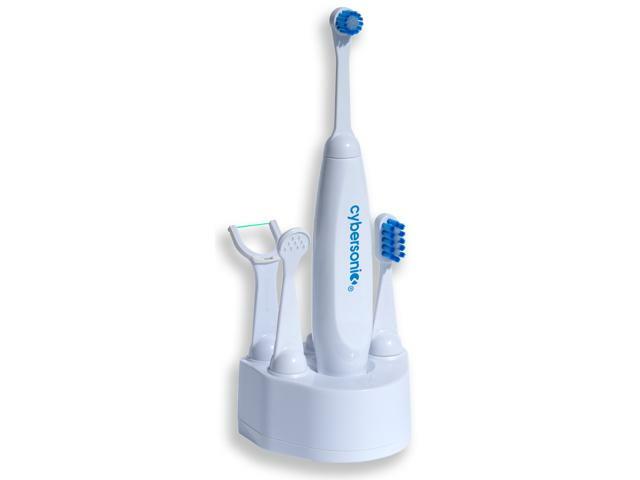 Go to Sonictoothbrush.com, look for the Cybersonic 3 system, and then use the coupon code 11486826. This will get you the Cybersonic system AT HALF OF THE STANDARD RECOMMENDED PRICE. For the BEST sonic toothbrush, with this level of this performance, this is a STUNNING deal. The quality of the construction is also solid. This brush has a reassuring weight in your hand, and it is very well-made. With normal use, it will last for many years. First, the 30-second timer. I tell my patients that no matter what brush they're using, even a sonic toothbrush, they need to spend longer brushing than the timer would indicate. I think around 5 to 6 minutes of brushing is great for most people. Second, I don't like the bigger-sized Deluxe brush head. I think it's too big! I worry that both this and the 30 second timer may encourage some folks to spend a shorter period of time brushing. In my experience, I STRONGLY recommend the NORMAL standard brush head to get the BEST results. All in all, in the time I've been using my Cybersonic sonic toothbrush, I've been extremely pleased with how it works. It has also been very reliable. It's my TOP RECOMMENDED toothbrush, due to stellar performance at an unbeatable price!